As Wednesdays are my Yarn Along Days I decided to mix the topics for Day 3 and 4 of Knitting and Crochet Blog Week. The assignments were: Day 3: Make your own infogaphic (no fancy imaging software needed, you can draw it on paper and photograph it if you want) to convey any element of your craft(s). It can be just for fun or a thoroughly researched presentation of an idea/finding. and Day 4: What are your favourite colours for knitted or crocheted projects. Have a think about what colours you seem to favour when yarn shopping and crafting. Look to see what colours you have used in your projects. Compare this, in turn, to the colours that are most dominant in your yarn stash – do they correlate? When I read the topic for Day 3: blog about something using an infographic, I immediately thought about my stash. 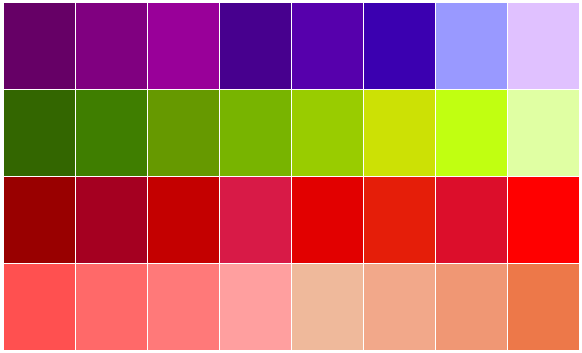 So Day 4’s topic “colour review” is the perfect topic to match the infographic topic with. But lets jump straight in (to my stash). I would say I don’t have a special favourite colour at least not for knitting but I do like bright colours. My alltime favourite colour is purple in all shades (see me broken seed stitch socks...). For our appartement I have a great liking for greens between lime and olive, so rather yellowish greens and bright cherry reds (my big blanket shows it a little bit, yes for a perfect blanket the mint stripe would be light green but they didn’t have that colour)). And for clothing at the moment es it is spring I really enjoy everything coral and peachy (see my Gemini top). So when shopping for yarn I’m normally drawn towards that colours but I usually buy what I think I can turn into something nice. Now I checked my stash. I have a lot of colours but hardly any in my favourite colours. This could be because if they was something in my favourite colours I would have used it already. If they are purple or that special shade of green, then they are leftovers from projects. The infografic implys that I also have a lot of other self-bought yarn in green but this is nearly all for the star stitch blanket I am making. 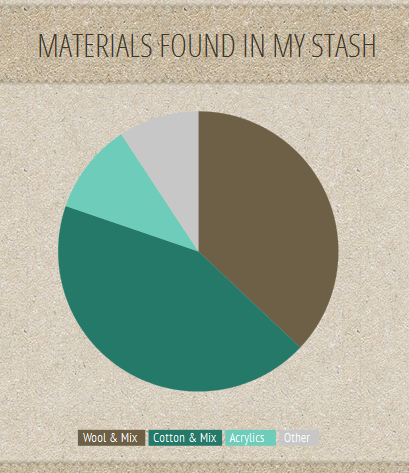 Well anyway I decided to do some infographics that included all: my stash as a whole. 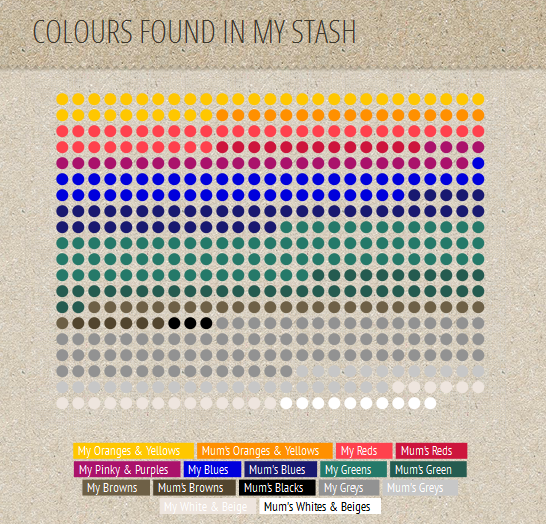 I made a big infografic on infogr.am showing you what colours I have and of this colour what came from my mum’s or my grandma’s stash (so stuff I never bought but just got, like it or not – no ok, the most hideous yarns I didn’t take) and from what material my stash is made of. I thought it was quite cool but I don’t manage to embed it here (a problem that other wordpress users seem to have experienced too) as a whole so I cheated and screenshoted both parts. To see both of it together you can simply have a look on my infogr.am page. By the way: this free tool works pretty well. I would only really like to know what is wrong with the embedding. You get HTML Code to embed the whole thing and I included it in my post. This works well for things like Ginny’s Yarn along picture for example but there seems to be a problem for this one. Well, a mystery yet to be solved, but not by me, I guess. So, have a nice yarn day and hope to read about your favourite colours and your stash! This entry was posted in Knitting & Crocheting and tagged 4KCBWDAY3, 4KCBWDAY4, Knitting & Crochet Blog Week IV 2013 by kathatravelling. Bookmark the permalink. The graphics are really nice and represent a healthy stash! Cool graphics. The problem I had with those on my blog is that they were too big. A screen shot is such a good solution. Easiest way out, right 🙂 I was just happy it wasn’t just me.